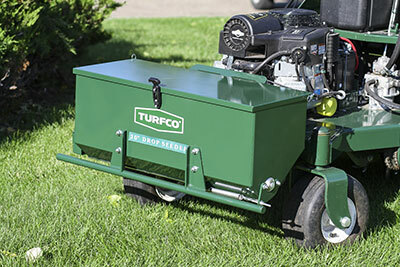 Turfco introduced a new, 30-inch drop seeder attachment for its TurnAer XT8 stand-on aerator. The seeder attachment mounts directly to the front of the TurnAer XT8 and has a 30-inch seeding width that matches the aerating width. The attachment is fully integrated with the machine, including controls to adjust the drop rate. The attachment holds up to 65 pounds of seed and includes a window so operators can see when it’s time for a refill. The XT8 and 30-inch drop seeder attachment are available now through Turfco Direct, which ships orders directly to customers.